Were I ever to suffer from rheumatism I think treatment at this well would be one of my last resorts. From a small car park provided to serve walkers to a nearby panoramic viewpoint, quiet, above Barmouth teeming with visitors on a very hot August day, I climbed for almost two hours up into the hills to find this well. Admittedly, the time was somewhat extended by my getting lost a couple of times, but this must still be a good two or three mile walk from the car park. 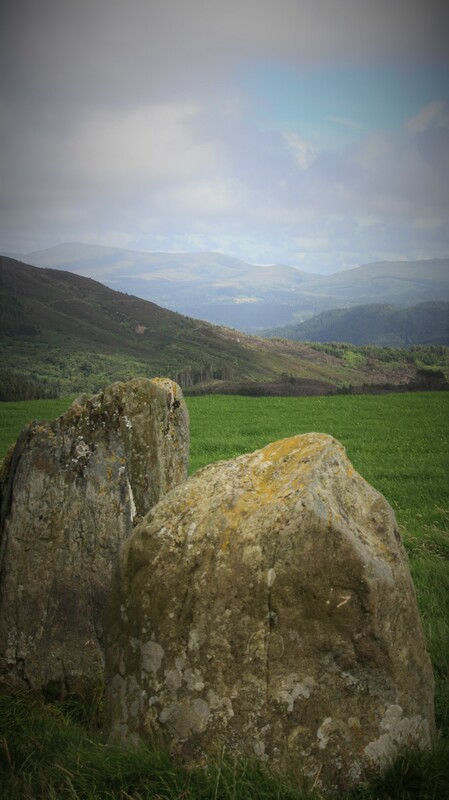 The well is about a mile to the NNE of the farm Sylfaen marked on OS maps, and the route passes through a small stone circle, with two standing stones at the centre, known as Cerrig Arthur. 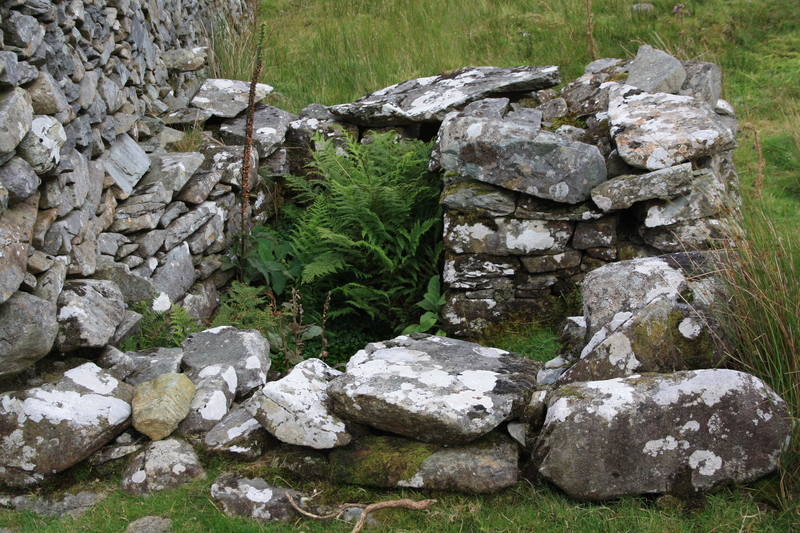 It is difficult to determine who the main users of this well would have been.it is hard to imagine rheumatic residents of Barmouth making the journey, although people were much more hardy back then and thought nothing of walking substantial distances. More likely, I suspect, these hillsides were much busier in the past. 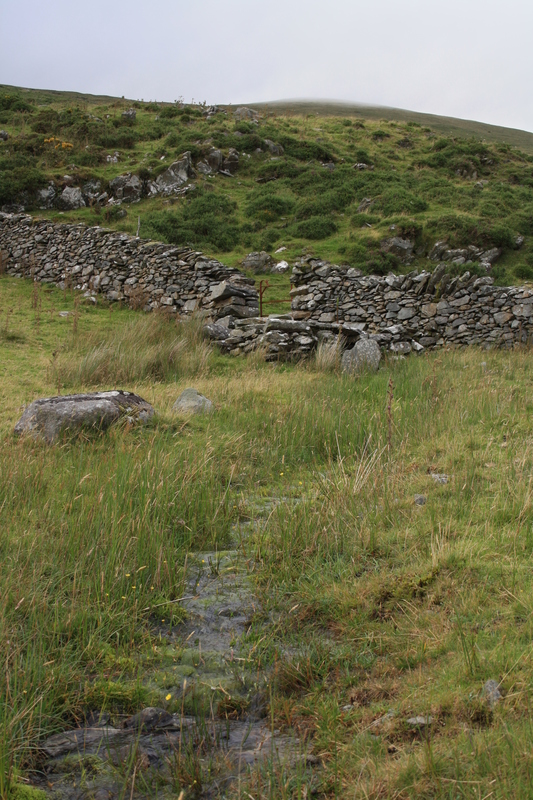 There are remains of dwellings scattered around, and the several trackways that converge around the well were quite possibly major thoroughfares and driving routes before the A496 was built to speed people along between Barmouth and Dolgellau. 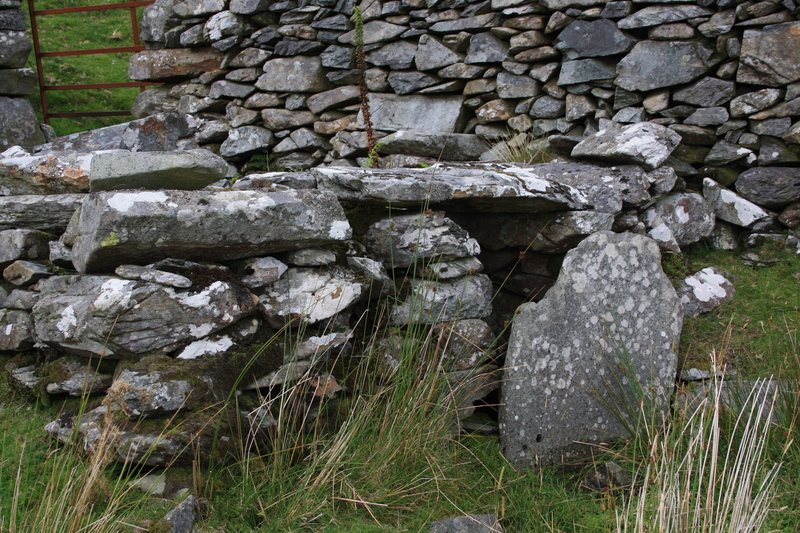 The well itself is of dry stone construction, built up against and partially into a stone field boundary. There are three steps leading down into the pool from one corner. The pool is some 4 feet long and 3 feet wide, the water was maybe a foot deep, covering a stone bottom to the pool. As can be seen it is overgrown with ferns and pond weed. 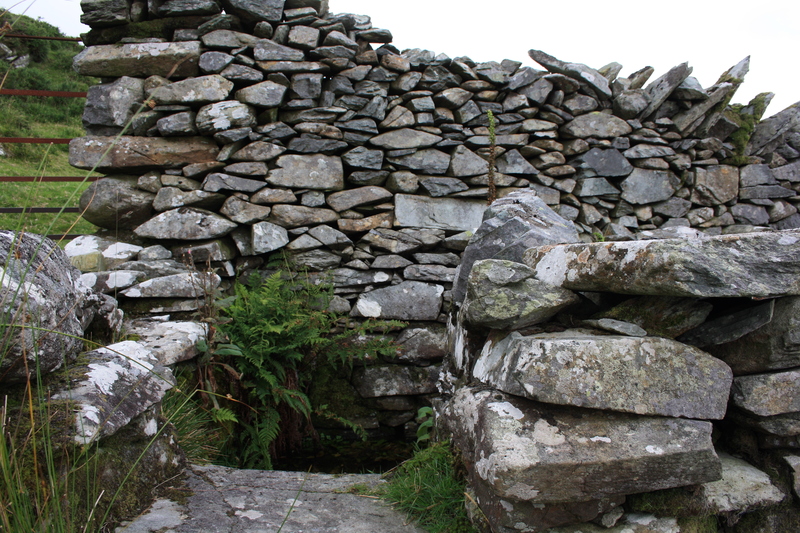 Water enters from a small gap in the stonework on the western side and flows out through a channel, covered by a very large flat piece of stone on the east. It flows away forming a substantial stream down the hillside towards the farm buildings of Goledd with which it shares its name. 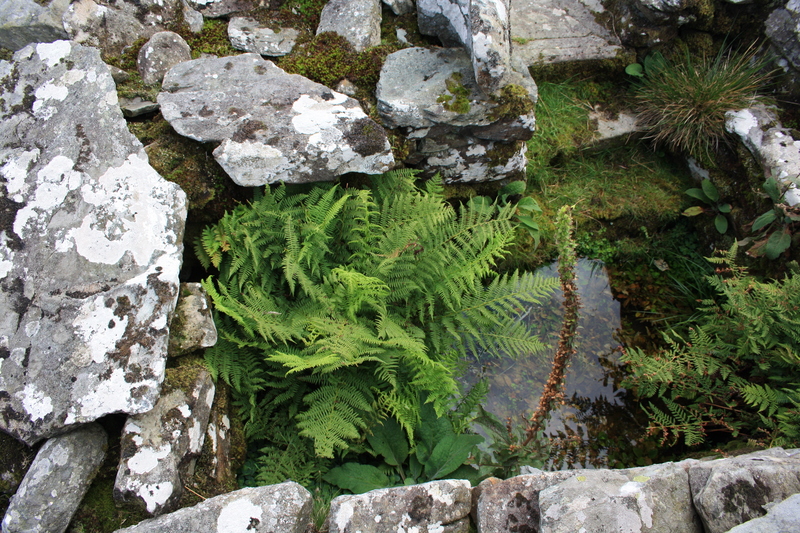 The well, and its believed efficacy for curing rheumatism and scorbutic complaints are noted in the inventory of the Royal Commission on Ancient and Historic Monuments. This information is repeated by Jones in his Holy Wells of Wales (1954), who adds an alternative version of the name without the mutation, Ffynnon Goledd, citing a piece in Bygones from 1880 as his source.